Anthony J. Shimer, a florist by trade, left a sum of money in his will for the creation of a monument. His executors, H. H. Gilkyson and L. B. Kaler, chose Trego after being urged to do so by Harrison S. Morris and Edward Coates of the Pennsylvania Academy. Trego’s neighbor, Alexander Pickering, holding a flower pot, posed for the deceased Anthony Shimer. A surviving photograph shows Trego posing with the clay matrix for this work in his studio. It is unknown where the statue was cast. 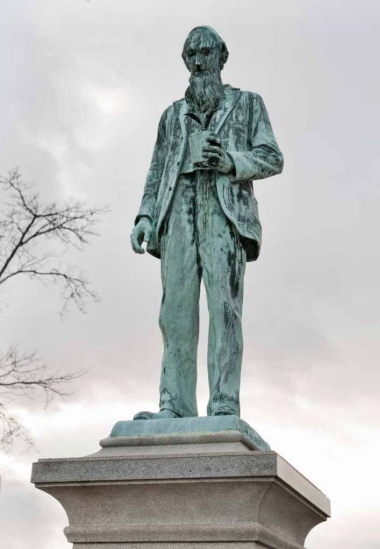 The statue is the only full size and finished work of sculpture by Trego known to exist. The statue and base both seem to be in sound condition, but the bronze figure is suffering from more than twelve decades of exposure to weather and pollution. The surface is quite stained and corroded in some areas.